There was a point in the not-so-distant past where buying an affordable compact 5-door meant that you were sentenced to a bland, amenity-free driving experience but the 2012 Kia Rio 5-door is a great illustration of how much you can get for your money in the modern compact segment. The Kia brand as a whole has come a long way since their early days in the North American market with an influx of more powerful and luxurious models like the Optima and the upcoming KH Concept but even the 2012 Kia Rio 5-door (the least expensive model in the Korean automakers lineup) offers a surprising level of quality – from the peppy 4-cylinder engine to the loaded up interior packed with modern amenities. The 2012 Kia Rio 5-door offers an exterior design that is very similar to the rest of the brand’s lineup, with a uniquely shaped upper grille area and large, bright headlights. My test car came in the striking Electronic Blue with the big, bright 5-spoke wheels that are standard for the SX package. The Rio 5-door has a very compact exterior shape but the large greenhouse and short bonnet area allow for a sporty shape while also improving the amount of interior space – both for people and cargo. The Rio 5-door features a unique lower front fascia from the 4-door models with the center section separated from the outer fog light areas and those fog light bezels hold small, projection style lights in a black surround rather than the larger mirrored bezels of the Rio sedan. 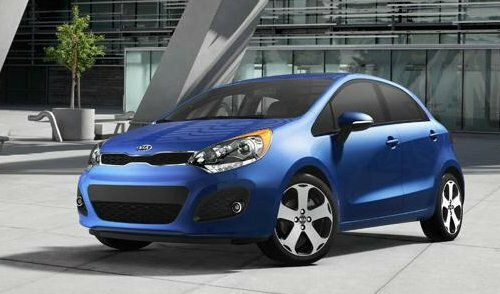 Along the sides, the Kia Rio 5-door wears black pillar covers that accentuate the sporty feel of this compact 5-door hatch and out back, the lower fascia sports more black trim. The shape of the 5-door Rio allows Kia to mount large, rounded taillights that are also unique from the 4-door models – all of which are points that make me prefer the 5-door over the 4-door models. I’m typically not a wagon/hatchback lover but in the case of the Kia Rio, 5-Door SX models are my favorite of the model lineup. Inside, the 2012 Kia Rio SX 5-door really shines with amenities that were once reserved for high end performance and luxury models but they have now become common in compacts that are appropriately growing with the industry. This begins with power everything; including the door locks, windows, and drivers seat. Gone are the hard rubber and plastic panels that once dominated the compact car segment and Kia has replaced those with leather surfaces and soft-touch padding on the dash and armrests. Leather is included in the Rio SX 5-Door Premium Package but standard premium knit cloth seats – although the leather trim added a touch of class and the heated seat feature made for a great addition during the coldest days of Michigan’s 2012 winter. Most importantly with the heated seats, they heat up very quickly even in temperatures nearing 0. The rear cargo area of the 2012 Kia Rio SX 5-door offers enough room for an average family shopping trip but if you need to haul bigger items or simply more than will fit in the rear hatch area, the rear seats fold down to greatly increase the amount of cargo space. You can fold down on side of the rear seat at a time in case you need to have a rear passenger but for optimum cargo space both seats fold down – allowing you to pack things into the Rio right up to the front seats. All of the 2012 Kia Rio 5-door models come with steering wheel mounted stereo controls but the SX package adds controls for the cruise control system and Bluetooth wireless controls. My test vehicle was also equipped with the push button start system – another convenience that is hardly needed but adds to the overall ease of use of the Rio. Finally, my Rio SX 5-door test car was equipped with the SX Premium Package which, for $2,200, adds the aforementioned push button start, some great looking leather trim on the seats, a power sunroof and Kia’s high end navigation system complete with a backup camera system and Sirius XM radio. The navigation system is very user friendly and easy to learn while the stereo system offers AM, FM, CD, Sirius XM and simple iPod/USB music integration with the use of the large, bright touchscreen panel. In short, there aren’t many features that my loaded up Kia Rio SX 5-door didn’t have while offering plenty of room for four adults (or two adults and three smaller children) with an MSRP of just over $20,000. Those who are less interested in that gadgets like the Nav system, push button start and heated seats can get into the Rio SX 5-door for just $17,500 – although I would recommend going for the full experience and paying for the fully loaded Rio. My 2012 Kia Rio 5-door SX test car was powered by a 1.6L 4-cylinder engine sending 138 horsepower and 123lb-ft of torque to the front wheels via a 6-speed automatic transmission. That doesn’t sound like a whole lot of power but with a curb weight under 2,500lbs, the 1.6L engine is more than enough to allow the Rio 5-door to keep up with traffic and even tickle the triple digits on the speedo. My main complaint with the Rio 5-door is the same as many test vehicles that I get and that relates to the transmission. I love shifting my own gears; especially in a compact with a fairly high revving 4-cylinder engine and while the Rio SX 5-door got along very well, I bet that there would be at least a little more “fun to drive” factor with the Rio. However, am I willing to trade my interior goodies for the manual transmission of the entry level Rio LX? No…but it would be fun to see a manual transmission option for the loaded up Rio 5-door models in my opinion. That being said, the 2012 Kia Rio SX 5-door offered solid, quiet acceleration around town and on the open road, the cabin was quiet and the ride was smooth. The steering is tight and responsive when handling an area with lots of turns but when cruising out on the highway, the suspension system does a nice job of dampening the rough spots in the road. Under normal circumstances, the Rio easily met all of my expectations whether driving around town at 35mph or running at 70+ mile per hour highway speeds and I enjoyed driving this spirited compact 5-door. Also, in the everlasting battle of fuel economy figures, my Rio 5-door averaged around 35 miles per gallon over the course of a tank of gasoline during normal driving with a mix of highway and city driving. While driving the Kia Rio 5-door, the Detroit area was blanketed in a few inches of snow one night and I found myself about 30 miles from home with barely treated road surfaces. My drive home sent the Rio trudging through several inches of sloppy, slushy snow and slow going but even though the majority of vehicles on the road that night were four wheel drive trucks and SUVs, my little Rio test car performed beautifully. I turned the traction control system off at low speeds to let the tires spin and dig through the deeper snow but once I was moving, the Rio was very stable and sure-footed while dashing through the snow. The 2012 Kia Rio SX 5-door is affordably priced at just over $20,000 when fitted with all of the high tech goodies mentioned above with a drivetrain that offers incredible fuel economy for a non-hybrid without sacrificing the drive quality. While a manual transmission option for the higher end Rio 5-door would likely make the car a bit more fun to drive, the 138hp 1.6L 4-cylinder engine mated to the 6-speed automatic transmission offers more than enough power for the Rio to keep up with fast moving traffic on the highway and enough low end torque to get you off of the line when trying accelerate to merge into flowing traffic. Kia has come a long way over the past decade and the Rio SX 5-door is a great example of just how far the Korean automaker has come – and how much more a consumer can get out of a low-priced 5-door compact. Driving an inexpensive car no longer means having to suffer without amenities and the 2012 Kia Rio SX 5-door is positive proof of that fact. Couple of things: There aren't any power seats in the SX or any other model and the mileage isn't quite up to the marketing claims in real world driving. On a recent trip to Key West I was able to achieve a way more than respectable 30 mpg driving at 80 mph, AC on with the car carrying two 6 foot plus men with all our luggage. In city driving off the freeways comes in at 25 mpg. Again, more than respectable. It should be pointed out that the SX's tuned suspension rides a bit more firm than the other two models. Might note appeal to everyone but the improved handling is super for this little car. I love my fully loaded Bright Silver SX and its fun factor. Test drive one.You won't be disappointed.